This stunning Celtic Yarns dress is in immaculate condition – only 18 months old,sadly for sale due to major growth spurt. 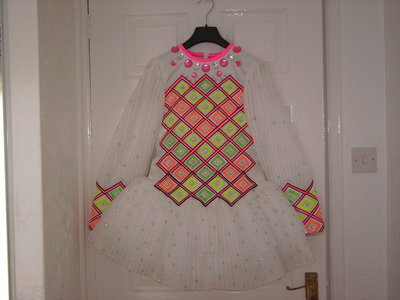 White twinkle pleated satin skirt and sleeves, and white twinkle satin bodice with georgeous neon coloured embroidery. Covered in swarovski crystals this dress is truly amazing on stage – beautiful tiara headband and two pairs of bloomers included in the asking price of Â£550 pounds sterling plus shipping from Scotland. Would suit approx 10/12 yrs. Approx 1 inch down each seam let out. Asking Price: Â£475. Shipping costs are included for my own country, overseas shipping is extra. Sale is final.